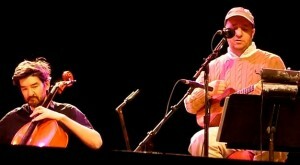 The Magnetic Fields are out-and-about on tour having recently released a new album, Realism. Realism pretty much follows the same trajectory set by 69 Love Songs – short pithy songs recorded with acoustic instrumentation. The Magnetic Fields are the only band that I can think of that has pulled a reverse Dylan – hang up their electric instruments and go entirely acoustic. The first half of MF records had keyboards and drum machines. The recent half of recordings, in contrast, eschew entirely what would pass as drums and are otherwise recorded with very lo-fi instruments: ukulele, zither, cello, etc. I love 69 Love Songs and i as much as the next guy, but I don’t think I am alone when the pre-release press for Distortion came (“more Jesus and Mary Chain than the The Jesus and Mary Chain“), that a strong hope was kindled that MF were to return to at least Get Lost levels of production and instrumentation – which by any other bands standards, is not a high level. Alas, Distortion was a very small deviation from the current lo-fi direction. After following The Magnetic Fields for over 10 years now, after hearing Realism, and after seeing a few of the shows supporting the album, I think that The Magnetic Fields could use a shake-up. For the next release, I suggest MF get the ‘Butch Vig’ treatment and replace the ukulele for a double neck key-tar and go ‘huge’. That would be sweet. Here is a live take from a recent show on a classic Get Lost track. Yesterday’s Yo La Tengo show reminded me of the first time (technically it was the second time, Stephen played an instore earlier that afternoon) I saw Magnetic Fields when they were their opening band. Compared to the lighthearted banter and fantastic sound of the shows like this one that was recorded at Cat’s Cradle in North Carolina, they were very distant and sounded “off” live. It could have been the large venue, huge stage and nearly empty room that got to them, but it was very disappointing compared to the live recordings I had heard of them up to that point. This show and another one that I have of them from DC in ’95 are still some of my all time favorite live recordings. 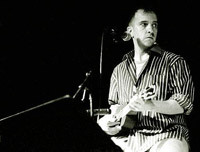 In the spirit of satirizing the more famous Three Tenors (Luciano Pavoratti, Trini Lopez, and Glen Campbell), Stephin Merritt’s live-only Magnetic Fields ‘69 Love Songs‘ era male vocalist revue (SM, Dudley Klute, and LD Beghtol) were still in the salad days from that critically acclaimed album during this performance on Super Bowl Sunday 2003. 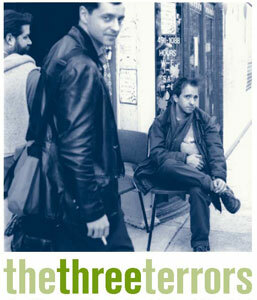 This performance was the 3rd of 4 one-off, theme-oriented, NYC performances between ca. 1999-2005. This time around the team featured an eclectic range of songs of drinking, drugs, and delirium, with drugs liberally including female hormonal replacement therapy (Loretta Lynn). As I recall the other shows consisted of valentine songs, broadway/show tunes, and NYC-oriented songs, respectively chronologically. Based on TSOI collaborator Avalanche, who attended shows #2-4, this was the best of the three. Ballroom all ages audience was much obliged. I don’t have a recording to make my point but instead will drop another Magnetic Fields track or two to show that I am a good sport. Magnetic Fields were not part of CMJ but played during CMJ week which, this year, is good enough. 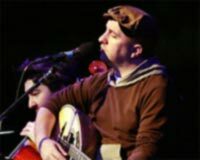 Live, Stephin Merritt and company dip into the many MF albums, along with choice tracks from his many side projects and soundtrack work making each show full of surprises. As mentioned in an earlier post, the newest MF album, ‘Distortion’ missed its mark a bit, in part, due to a retardedly high bar of expectations that Stephin Merritt has set for long time MF fans. A pre-release proclamation that ‘Distortion’ is “more like Jesus and Mary Chain then the Jesus and Mary Chain” didn’t help either. The conceit made for good copy at press time but just further raised the impossible expectations and, in practice, resulted in muddy production that didn’t do the songs any favors. One of many reasons to see Magnetic Fields live these days is that the songs off of “Distortion” are played as they probably should have been recorded – minus the busy melody burying ‘JMC-esque’ production. Here is one such buried gem. Magnetic Fields played four sold out nights at Town Hall, NY immediately following the release of their new album Distortion. The much ballyhooed conceit behind the album Distortion was that the album was to sound more like The Jesus and Mary Chain than the Jesus and Mary Chain. Naturally, I was expecting a considerable departure from the more low production and largely acoustic recent albums 69 Love Songs and i. A bit to my disappointment, all Distortion has by way of JAMC reference was taking songs that could very well been on any of the previous two albums and overlaid a slightly more fuzzy guitar bit and buried the vocals. What furthered my aggravation was that Stephen Merritt sings on only half of the songs. I probably wouldn’t get much arguing if I claimed that Distortion is the weakest Magnetic Fields album to date. As for the live show, I was hoping that Stephen Merritt was going to do a Dylan and put down his ukulele and go all electric or hell, go all Kraftwerk. No such luck. The show nonetheless didn’t disappoint. One good aspect was that they played something off of nearly the whole Merritt back catalog including his contributions to the Lemminy Snicket and Eban and Charley soundtracks, the 6ths albums, Gothic Archies albums, and his theater work. I have to say that the Merritt catalog is mighty deep at this point. What also made the show enjoyable was that many of the new songs that Merritt didn’t sing on the new album, he sang, making the live versions a step-up from the album version as illustrated by this track. The down side was that like the album Distortion, Stephen seams either a bit tired or bored, giving over singing duties to Claudia and Shirley for half of the songs in the set–again regardless of who did the vocals on the album version. On a side note: Stephen Merritt gives great interviews. I recommend reading this one he gave to the Village Voice. Since The Magnetic Fields have a new album and tour coming up this month and The Shins “Wincing the Night Away” made my list of favorite albums of 2007, It seems appropriate that now would be as good a time as any to post a Shins cover of a Magnetic Fields song. This is a track from their 2005 between-albums tour when they played Webster Hall in NYC. “Chutes Too Narrow” had come out 2 year earlier in 2003, yet The Shins had not a single new song except for this Magnetic Fields cover. I was pissed with The Shins for years but much has now been forgiven with “Wincing the Night Away”. Note to all bands out there: Being an active band and doing a tour some years after the last record with not a single new song is a really good way to get my goat, and believe me, you don’t want to get my goat. My goat is a demon goat. I saw a very amusing video of Stephin Merritt performing live on Good Day Atlanta while promoting Lemony Snicket on YouTube. He is being interviewed by the typical early morning television host who has no idea who he is and it’s fantastic. He plays one of the Gothic Archies songs solo. The last time I saw him play solo, someone requested “Alien Being” which he started to play, then confessed that he no longer knew the lyrics. 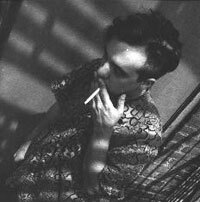 This was recorded live in 1995 at The Black Cat in Washington, D.C.
First off, I’ll say that I absolutely love The Magnetic Fields. I’ve loved them ever since I came across the “All The Umbrellas In London” 7″. The very first time I was supposed to see The Magnetic Fields live, they were playing a one-off show in Chicago. Flying in, playing the show, flying back to NYC. I lived in Minneapolis which is about 6 hours away, so my friend and I hopped in the car, drove down, got to the show and then found out that they had canceled due to Stephen getting sick. We skipped the show, which I later regretted since The Pulsars opened, but the trip wasn’t a total loss since Jessamine played an instore the next day. I didn’t actually get to see The Magnetic Fields until a couple of years later when they were opening for Yo La Tengo. This song was recorded live at The Mercury Lounge in 1995.